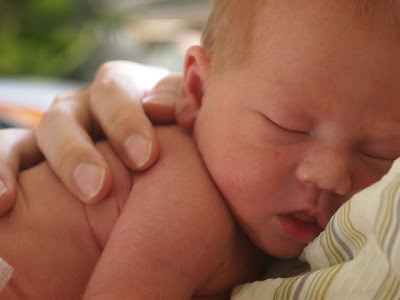 For those of you who would happily do without details of Noah's arrival to the world, skip this [rambling] post! Noah is 9 days old. We're so grateful to God for him, and we're hoping he's going to grow up to be blessed and be a blessing. We went to a labor class in April to learn about childbirth, and they prepared us for a 20 hour labor, a generally horrifying thought. My parents insisted that in the family, "our" women deliver much more quickly. No pressure. Of course, our family also has a long history of castor oil, which causes incredible indigestion and is said to induce labor. Along those lines, one friend compared labor to really bad indigestion- but her husband could also hear her screams from a block away. Another friend lent me her "Gentle Birthing Choices" book, which encourages women to welcome the contractions. It also has labor poems that were surprisingly helpful to this non-new-agey-non-poet. The chapter on giving birth in the ocean encourages women to consider the ocean current. And the fact that the baltic sea is freezing. Although I didn't have any plans for an ocean birth, I hoped to pray Noah into the world. The 5-1-1(five minutes apart, one minute long for one hour) rule (and strong enough that you can't talk) just didn't work for me. After my water broke, I was able to pray through the night and welcoming the contractions worked pretty well. It's customary for women whose water has broken to checked into the hospital, but we waited a while before going to the hospital because Lost is supposed to be available on Hulu by 8am EST (for the record, it wasn't). At the hospital at 10am, the midwife felt I was too comfortable to be far along in labor, so I went home again even though my contractions were about 3 minutes apart. Eug and I then decided to walk to Starbucks (don't judge), but I was in too much pain so we walked back home. We thought we'd try to watch a little hulu instead (the advice in our class had been to use distraction as long as possible), but again I was in way too much pain, and started to feel like pushing. At this point I wasn't welcoming anything, and I couldn't concentrate enough to have a thought about anything other than the possibility that this might go on for 20 more hours. So we went back to the hospital by 11am. In the exam room, they wanted me to lay down and be monitored for 20 minutes (whoever decided to make women lay down during labor?) until the nurse realized that Noah was already on his way out. A bunch of nurses and a midwife came to remind me to breath and push. Eug was busy registering for us, and made it just in time for Noah to be born at 11:26am. So Noah was born in the exam room and the atmosphere was pretty frantic (no cool music or wood paneled delivery room with a jacuzzi for us!) but my sense from the experience was that my hopes for the birth might have been as important as the actual event. Giving birth was so momentous that my main emotion was gratitude, which likely would have been the case however Noah made his way into the world. That said, to put in a plug for drug-free delivery, I really enjoyed being fully alert and awake after the labor. Now we're figuring out how to be parents to this whole new person-- we welcome your prayers. This is a wonderful story! You could have given birth at home for how quickly that went! Congrats, hon! Noah is just adorable, and I'll have to meet him when I move up to Boston this fall.